Regular readers of my blog will know that I am a huge Derby County fan – I even have a season ticket! 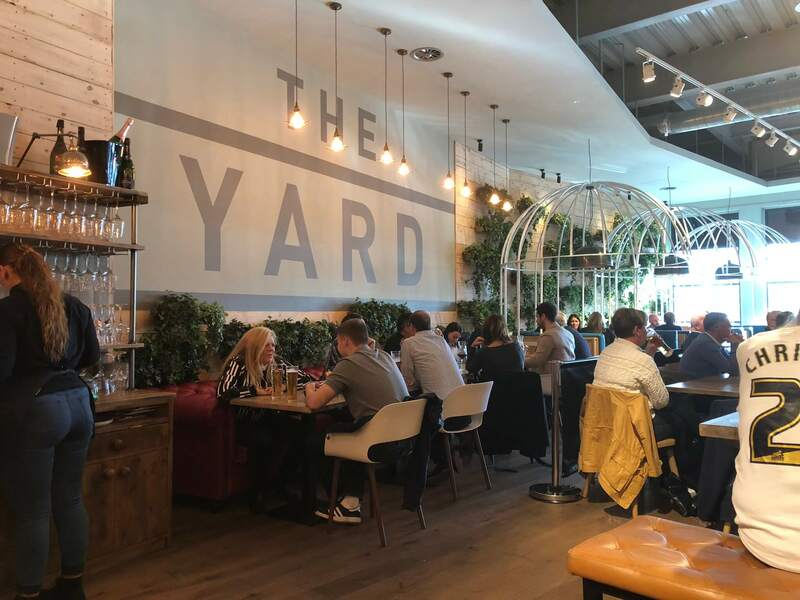 The Yard is a new restaurant which has recently opened at Pride Park, Derby County’s ground, and I couldn’t wait to try it out. After hearing good things, I arranged a pre-match warm up (or, as I like to call it, lunch!) for my brother and I last week. First impressions were great – The Yard is industrial chic with elements of botanical garden – think exposed brick, copper and birdcages – a look which is super popular for restaurants and bars at the moment. As it was match day, there was a limited menu of burgers, an all day breakfast and some vegetarian options. However, The Yard is open every day for breakfast, lunch and dinner – not just on match days! They also run a few special offers on drinks like 2 for 1 on after work drinks and designated driver drinks free (obviously not alcohol) which makes it a perfect place to pop in to for a couple of drinks. The atmosphere is great and the staff were super nice and friendly too. It was quite difficult to get served at the bar as it was packed for the match, but still a great place to come for a pre-match drink. I opted for a chicken burger and my bro went for the beef. 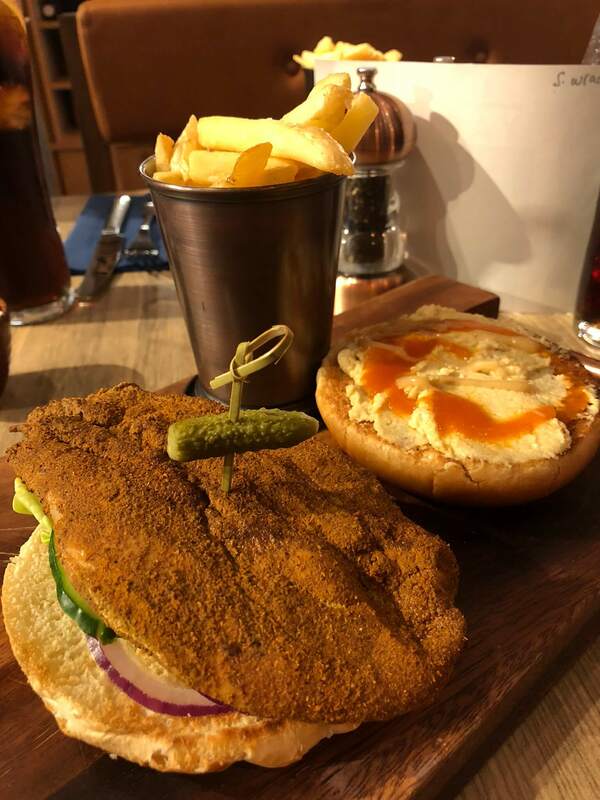 Mine was super tasty – chicken breast in a delicate coating which was quite spicy and served with a hummus and chilli sauce which was quite unusual but delicious. 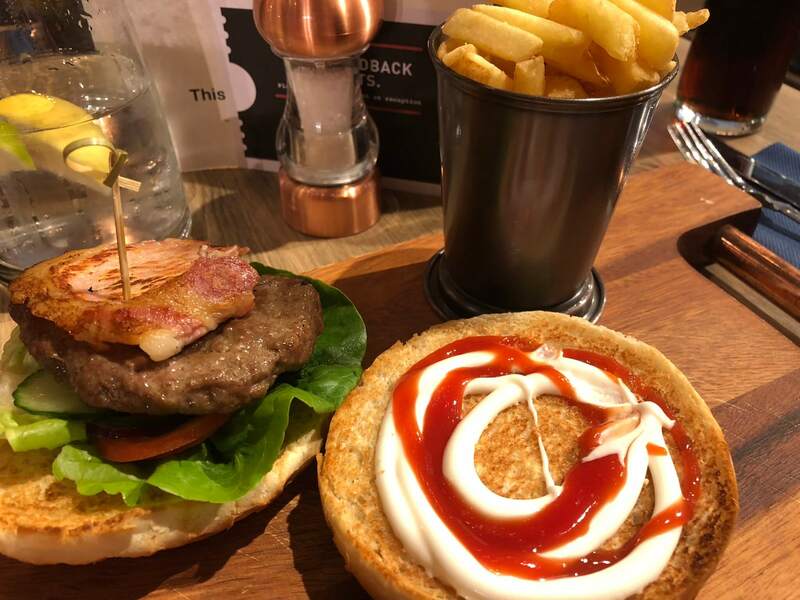 The burgers were served with chips and were presented beautifully on a wooden board with the chips in a metal pot. The food arrived really quickly which was surprising for saying it was super busy. I did think it was a touch on the expensive side, but then food at football matches usually is! It was definitely the best tasting pre-match burger I’ve ever had (bold claim!) and I’ll definitely be visiting again for a couple of drinks before kick off. Let’s just hope the score’s better next time!